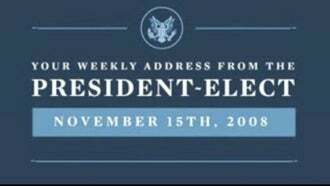 Good citizens of the United States of America and the world, I give you your first weekly address from the President-Elect of the United States. In this week's episode, President-Elect Obama discusses the economic crisis, speaking to the American people with the same type of straight-into-the-camera candor he showed during his Presidential campaign. "In this country, we rise or fall as one nation, as one people, " Obama says, "and that's how we will meet the challenges of this time—together." In next week's episode, I hope he gives us some ideas on how we can possibly come down from our election high when he keeps being so consistently awesome. Clip after the jump.